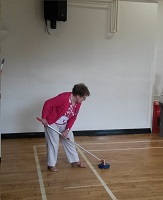 A small group of 30 members meet regularly every week to play kurling and socialise. The team looks forward to gentle exercise and companionship. Team matches are played against other kurling teams in the Salford area once a month. The group needed help with the cost of room hire, equipment, insurance and refreshments to keep the club running. 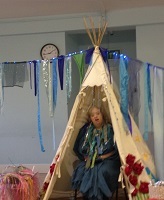 DIY is an established Theatre Company of learning disabled performers, using theatre as ab accessible and effective vehicle for building confidence, self-esteem, social interaction enabling people with learning difficulties to live healthier and happier lives. DIY Theatre applied to the Innovation pot to develop “taking Steps” a project that combines drama and formal research methods to explore what health and wellbeing meant to adults with learning difficulties and how DIY contributes to the wellbeing of members, families and the wider community. Lower Kersal Young Peoples group work towards improving health and wellbeing of adults and young people in the local community through a series of project strands. They applied to the Little Pot of Health Improvement fund for their community growing and cooking strand making use of their community allotment to affect a profound and sustainable change in people’s access to and usage of healthy food in our community and to share the learning. Incredible Edible grow and plant edible plants at sites across Salford, as well as educating people around “Green Growing”. The organisation has 30 volunteers who regularly take part in activity including Community Growing Group that meets every Sunday. The group applied to the Volunteer Expenses fund to have 15 of the volunteers DBS checked allowing more outreach work to take place as well as safety wear for the volunteers with protective work boots and gardening gloves.